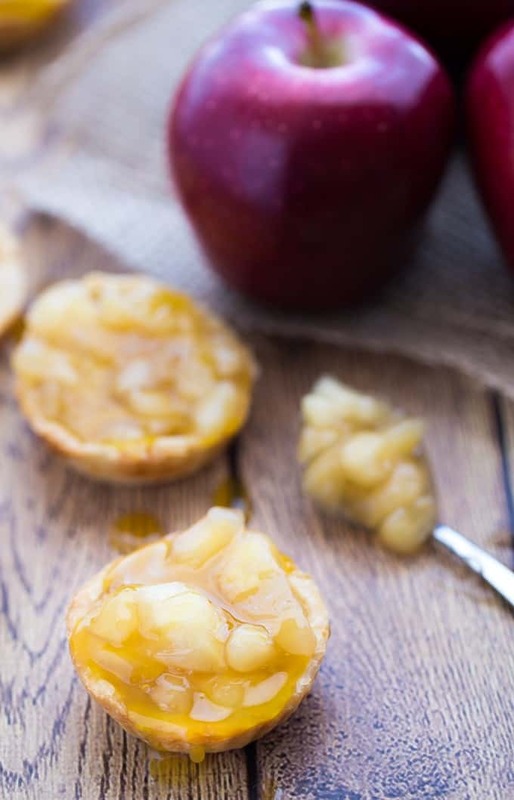 Three ingredients is all you’ll need to make these mouthwatering Caramel Apple Tarts. Yes, three. When you are pressed for time and have to come up with a quick treat, this is your recipe. You’ll need refrigerated pie dough, apple pie filling and caramel sundae sauce. I used the opening of a mason jar to make my circles. A glass would also work. 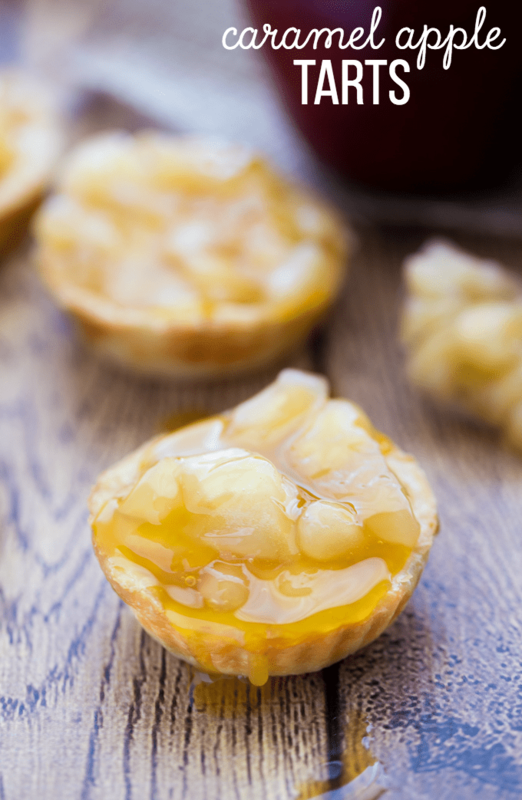 Try and get the circles to as close as possible to the size of your Wilton Mini Tart pan. If you’re a bit under or over, no biggie. Either stretch out the dough or tear some away to make it fit. The filling will hide your mistakes. You won’t need an entire can of apple pie filling for this recipe. Save it for another recipe or to serve on top of some vanilla ice cream. Mmmmmm. I could have just left them with only apple filling, but I was craving caramel. I’m one of those people who prefers caramel over chocolate. Don’t get me wrong, I love chocolate, but I adore caramel. Tell me I’m not the only one who feels this way! Grab some extra napkins because you are in for a gooey, lick your fingers (clean, of course) dessert! While you’re here, I have a few more caramel desserts for you to check out: Pineapple Sticky Buns with Coconut Caramel, Caramel Apple Cupcakes, Caramel Pecan Breakfast Casserole and Caramel Bacon Brownies. Also, follow my Caramel Pinterest board for more decadent inspiration. Sticky, sweet and easy to make with only three ingredients. This one’s for my caramel loving friends! 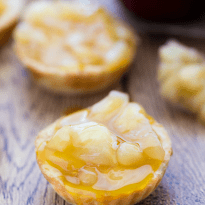 Remove tart shells from oven and place on a wire rack. Add 1 tsp of caramel syrup to each tart. Add 2 tsp of apple pie filling to each tart. Drizzle caramel syrup on top and serve. What is your favourite caramel dessert? One of my favourite treats my Grandmother used to make for me when I was young.I will try making some. Yum, and so easy to make. 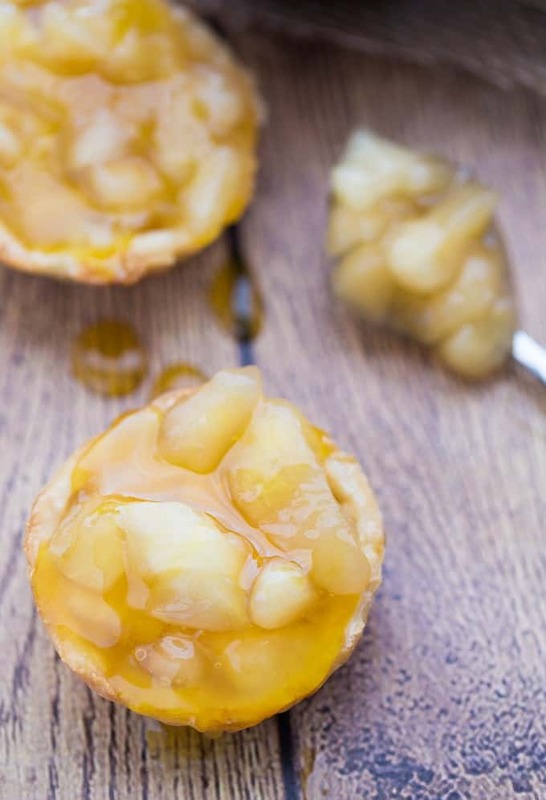 Loving these tart recipes! Oh my these sound so good, in fact to good to share, keep them all to myself..lol!! mmmmmmmmm I swear I can smell them! I need to pick up more shells as I made your chocolate tarts, which were a hit! I can have one right now …. they look so lovely Stacie ! Those look so good and are so easy! We love apples! Oh my goodness these look so sinfully good!! I could never stop at only one. Caramel and apple are so good together and this recipe only having 3 ingredients is unbelievable but oh so wonderful. I haven’t eaten this dessert in years. Thanks for refreshing my recipe book. Those look so good! And now I’m wanting to get some pie filling and some ice cream! Caramel and apple are one of my favorite combinations! I love that this recipe is so quick and easy, too! Just when I couldn’t decide what would be on our Mother’s Day dessert menu I discover these little darlings! Thanks for making it easy to decide! These definitely look and sound delicious, will be trying them soon! Wow, you could turn a choc-a-holic like me into a caramel lover! Those look wonderful. Thanks for sharing this with us at Dishing It & Digging It. 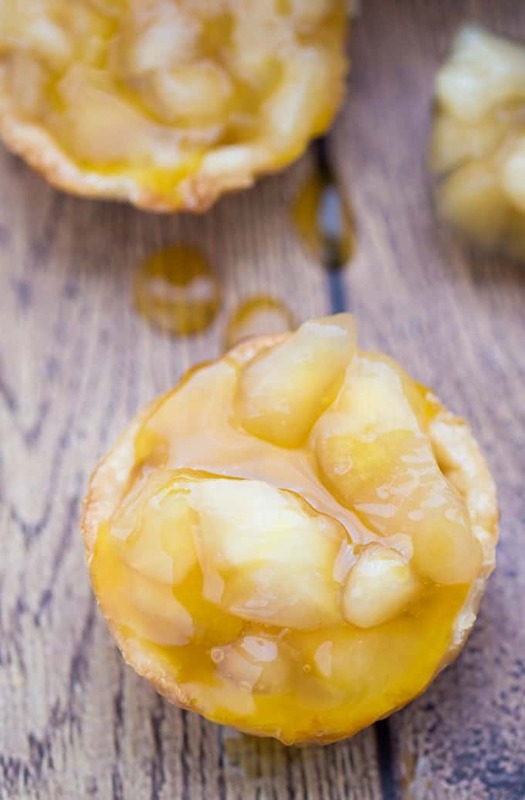 These caramel apple tarts sound and look delicious and are so easy to make. I love caramel as well and I tell you, you haven’t lived until you taste caramel cheese cake. It is hard to keep it as everyone loves it. Thank you for this recipe and all your recipes.